…………been a while. It is always good to take a break nd re group. Hope you have all been good? 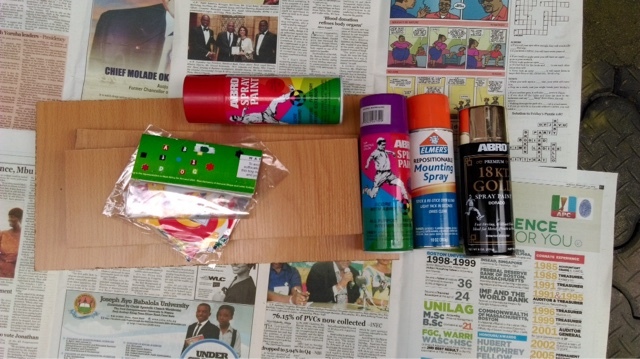 I got into some DIY recently and that is what this post is about; simple artsy DIY for your home or office. The wall in my house has been bare for a while now and I decided it would be great to have something simple but cool that is representative of us and so I set out. 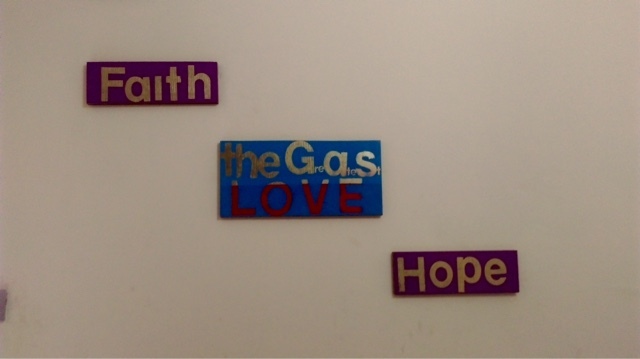 Little humours: that is greatest, not gas. Lol. Below are the supplies I got. you can get everything except the wood boards from your local art supply shop. The wood boards were given to me by our local carpenter. 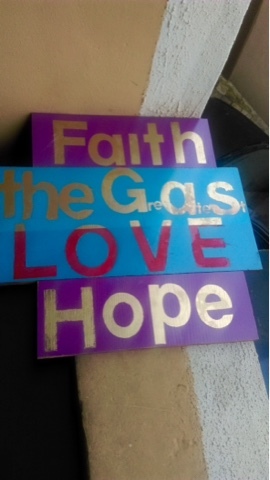 The supplies used include wood boards, alphabet cut outs, blue spray paint, purple spray paint, red spray paint, gold spray paint, adhesive spray, old newspaper, masking tape and scissors. Frankly I didn’t measure the board, I just saw what I envisioned in the carpentery shop and ask if I could have it and that was it. 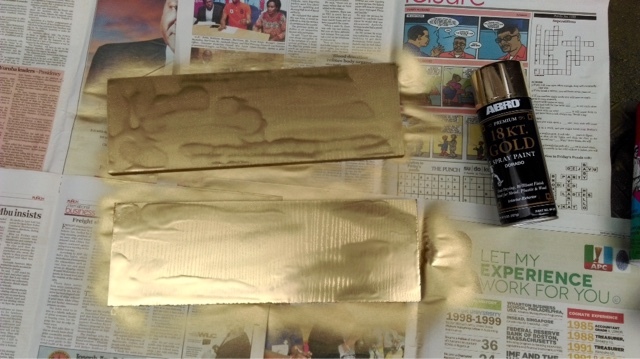 I wanted gold to be the colours of the alphabet and so with this in mind, I laid the wood boards on old newspaper outside the house and sprayed them gold. You want to do this in a well ventilated area. 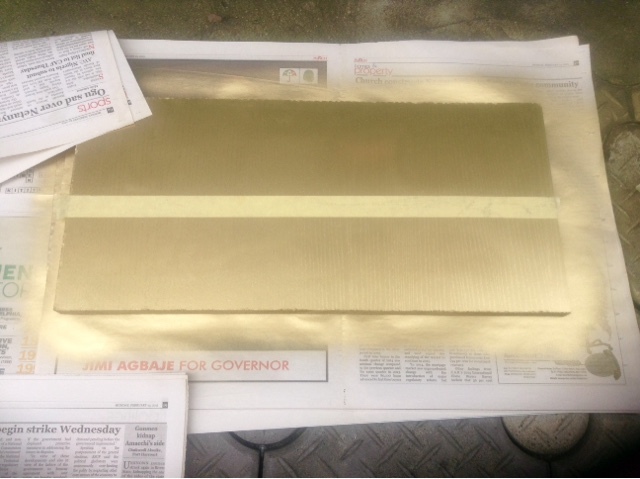 The wood was allowed to dry for 30minutes and repsrayed again in gold. 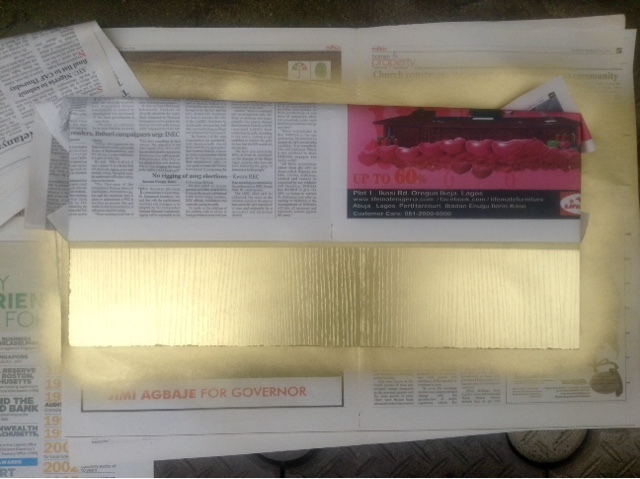 After another 30minutes of allowing the second layer of gold paint to dry, I placed my cut out alphabets on the board. Spray adhesive was first sprayed on the back of the cut outs before they were placed on the board. 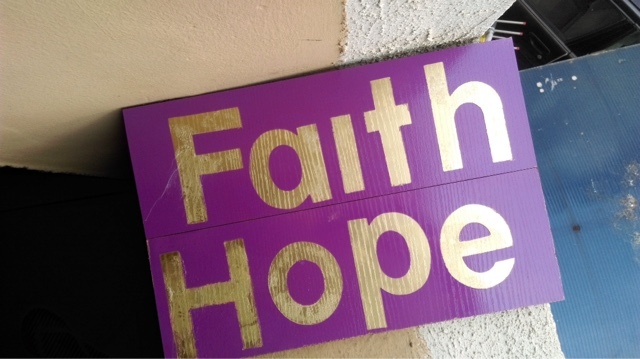 On one of the small planks I spelt out the word ‘Hope’ and on the other small one I spelt out ‘Faith’. 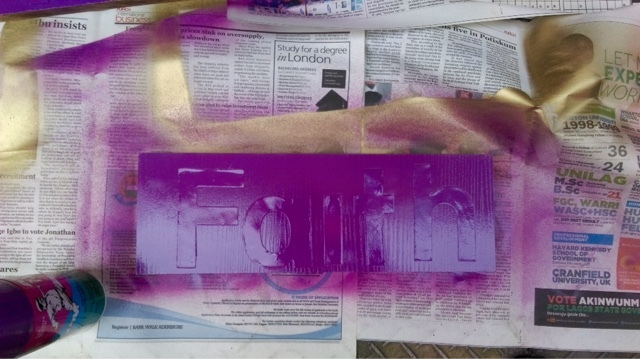 after sticking on the alphabet I sprayed the purple paint over the two small board and allowed it to dry for 30 minutes. 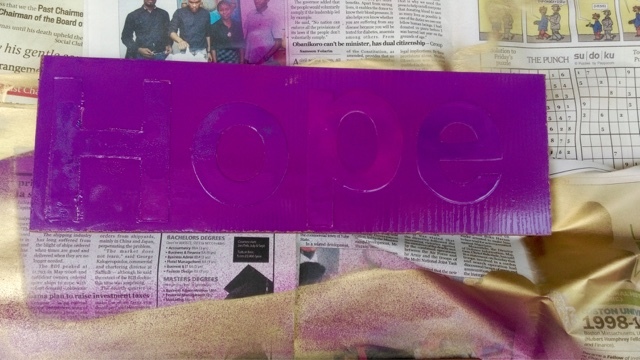 After the 30minutes had passed I resprayed the small board again with the purple paint and this time allowed it to dry for 1hour. For the bigger board, after the gold paint had dried I divided the board by 1/2 to 1/3and then I placed a masking tape across that division. 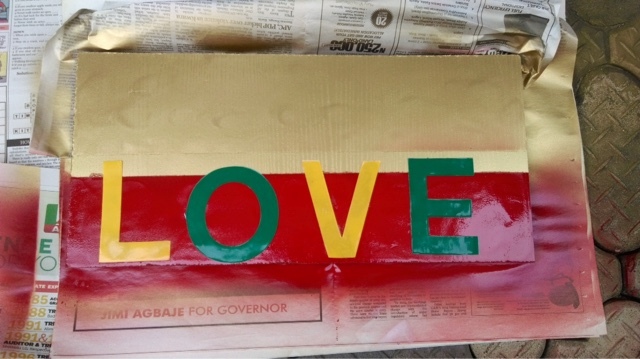 I did this because unlike the words hope and faith that I wanted in gold, I wanted the word ‘LOVE’ to be red. 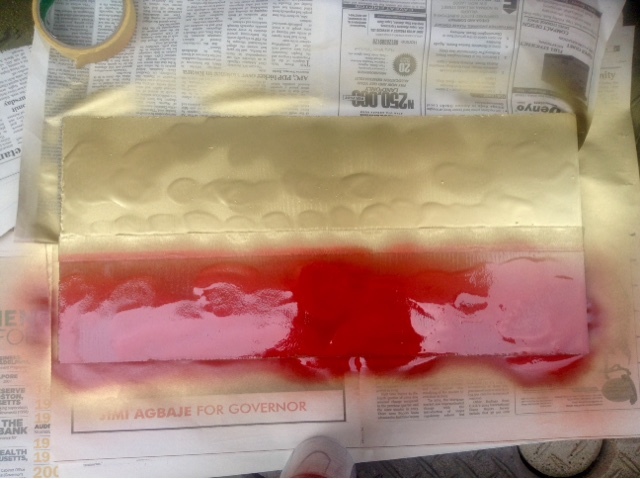 After placing the masking tape I, covered the top part with newspaper and sprayed the lower paint with red paint. 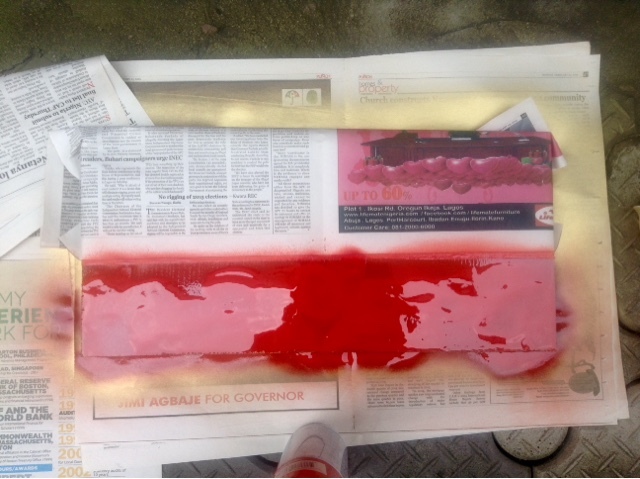 30minutes later I resprayed the lower part with red paint. 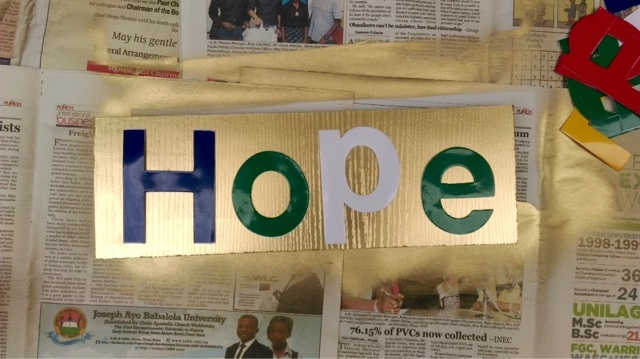 1 Corinthians13:13 And now abideth faith, hope, charity, these three; but the greatest of these is charity. 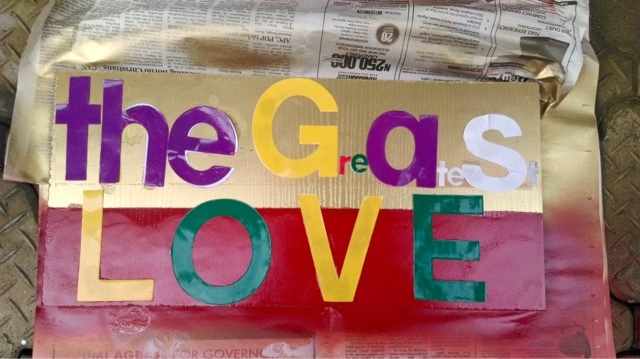 Once the red paint was dried I removed the paper used to cover the top half and then spelt out ‘the GreAteSt’ on the top gold part and then ‘LOVE’ on the bottom part. 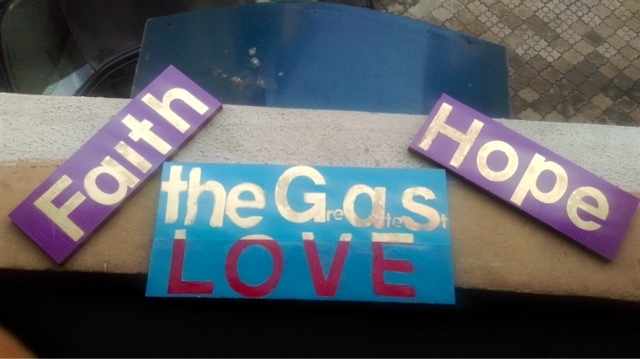 After sticking on these cut outs I sprayed the big board blue, I would have followed with the purple team but my purple spray finished so I made do with the blue spray paint. 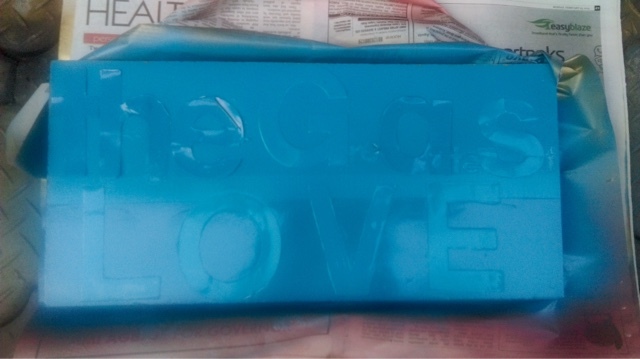 I allowed the board to dry for 30 minutes and then sprayed on the blue again and allowed it to dry for 1 hours. 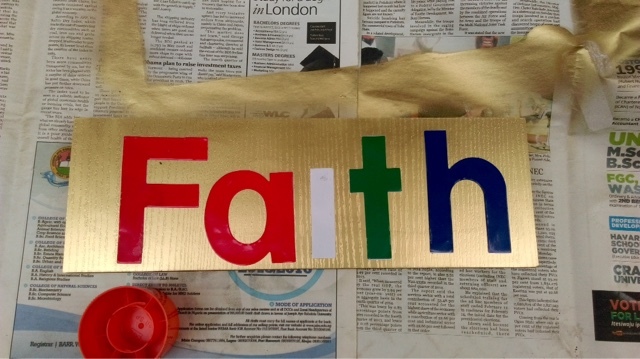 After one hours the cut out alphabets were gently peeled off, Hope, Faith and the GreAteSt LOVE, to reveal the colours beneath and the completed work. I had the carpenter come drill the wood and then nail the wall to hang my beautiful home made deco. 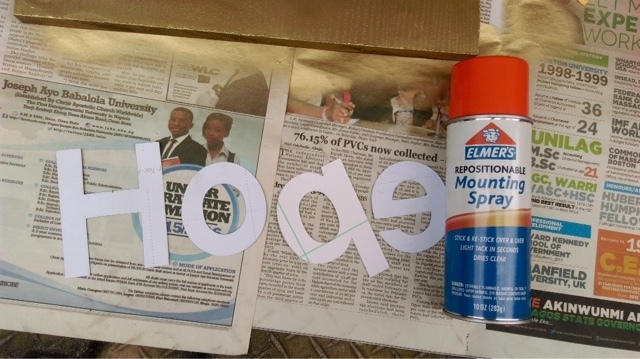 Quite easy and the cut outs can be dried and re-used a number of times. Plus you can write whatever you want, however you want and months later you can repurpose the wood. All at a limited cost. I hope you try it out, with words that inspire and speak to you of course. If you do try it out let us know and send us some pictures. You could even make it as a gift for a friend or family member. Please remember to share the post.